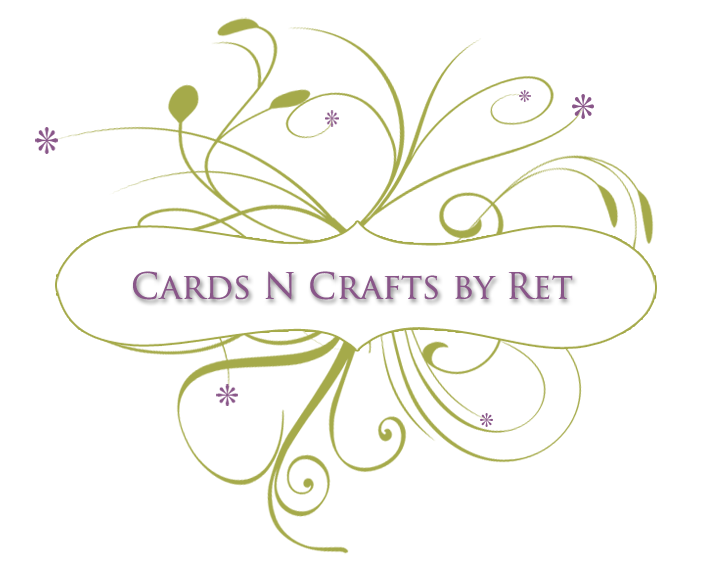 Handmade Cards, etc. created using Rubber Stamp images and various artistic techniques using, but not limited to: alcohol, dye, permanent, and pigment inks, watercolors, acrylics, and embellishments. Hi Everyone! Well, I finished this card a few weeks ago and just have not gotten around to posting it. I am bound and determined to keep up with my blog, so here it is! Better late than never, right?! 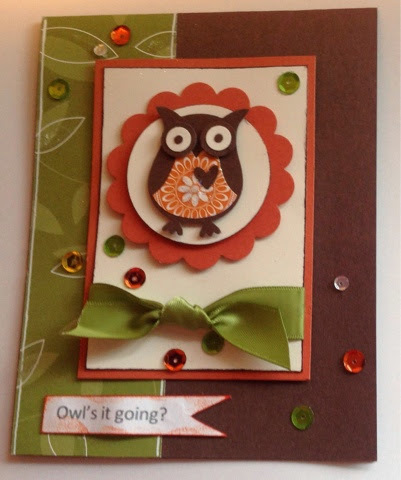 I made the owl with the owl punch from Stampin Up! I have to admit, all of a sudden I've decided I love the look of sequins on cards! Tell me what you think!! I think it's because they add a little splash of color and they add a little interest, too, I think. Or perhaps I've convinced myself it's bling, I don't really know! LOL. Also, I'm on an owl kick! Just love them! It seems so nice to have warmer weather! I hope you're enjoying it, too! Thanks for dropping by and viewing my card. PLEASE leave me a message, I love hearing what you have to say!!!! Hi Everyone!!! I'm so happy to say I have returned! You may be wondering where I've been, and the answer to that is....no where...right here at home. Unfortunately, however that's not so true of my mojo. :( You see, it conspired with my fibro and mojo decided it would leave me, and leave me it did. I pleaded for it to come back, but it didn't for a little over 2 years. How did I get it back? 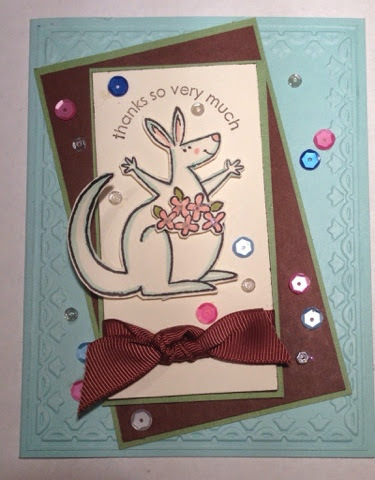 Well honestly, a month ago I looked up and joined several card making groups on Facebook. Seeing the projects and conversing with the crafters inspired and excited me and caused mojo to come out from wherever it went! So I blew the dust off my craft goodies and made a card! Although the card is a bit out of the box for me, I was so happy to have a stamp in my hand again!! LOL It happens to be a Stampin Up stamp this time, but I don't even know what the name of it is and I honestly didn't care I was just soooooo excited to have inky fingers! I dropped the sequins, got glue all over me and I tell ya, I was so happy! I had wanted to make a Thank You card for Kelly Panachi and rather than think about it and do nothing, I was deliriously happy to do it! So folks, I hope you've hung in there with me and will continue to follow my blog, and I promise, I will be blogging! I do have to admit that I am very, very rusty with Blogger and they've changed it all, so I'll have to relearn it. Oh well!!! LOL. And if you may have guessed, that's why my card isn't centered!!! I couldn't figure the placement out, but I will! Just please hang in there and be patient as things may be a little "off" while I'm trying to figure this out. hehe! Happy Mother's Day to all you Moms! Enjoy your day! And I shall return very, very soon! Hi Stampers and Friends! Can you actually believe how quickly time is passing us by? It's literally flying!! I can remember when I was small, and I was complaining about how slow a school week went by...my Mom would say "You wait until you get older, it'll go by so fast you won't believe it". Ofcourse I just filed the info in the "ya,right" file and forgot about it...and guess what...she's right!!! Time flies like a bird!! Christmas has come and gone, it was a lovely day here. We are so blessed to have each other. It was a great day! And now...here it is...New Years Eve Day!! Wow, 2012 is well on it's way!! Happy New Year my friends! I hope it's happy, healthy, and prosperous. 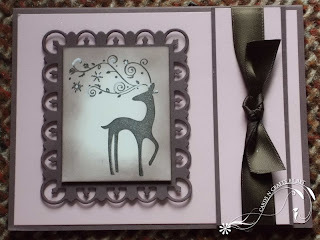 Today I want to share with you a stamp set from Stampin Up! called "Bright Hopes". I'm featuring 3 different cards I made with it. (click on pics to enlarge them.) I sure hope this will inspire you to use your stamp sets in many different ways. You get a little more bang out of your buck. ha!!! Whisper White SU 5/8ths inch satin ribbon. I stamped 5 trees and cut 4 trees out by hand. I glued the 4 loose trees back to back twice, and glued them on top of the bottom tree. Isn't it cute? I hope you like it! SU 5/8th's Bashful Blue Satin Ribbon. 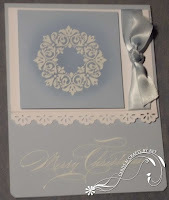 I used the Emboss Resist Technique with the wreath, if you have any questions just let me know! And lastly!!! My third card using "Bright Hopes". SU 5/8th Certainly Celery Satin Ribbon. stamps for more than "just one" card. Stamp and mix it up and have alot of fun! I've enjoyed stamping with you. It's New Year's eve, 2011. I hope whatever you choose to do tonigt, that you'll be with family and friends!! Live, laugh, love and be safe!!! HAPPY NEW YEAR!!!! WELCOME 2012!!! May it be happy, healthy and prosperous for all of us. Yay! A New Camera, Now I Can Start Posting Again! I hope everyone had a wonderful Merry Christmas! I know we sure did. We had a lovely day together. We are so blessed. And guess what...I got my camera!! Hubby bought me a small Casio and I'm not sure yet what I think of it. I find it hard to not get a blurry picture with it. I think it's because it's small and not much to steady with. But we'll see, I'm sure I'll get use to it. I wasn't able to share any of the Christmas cards I've made this year, and I've decided that I will now, even though it's after now. I hope you will enjoy them., I'll space them out a bit for you. 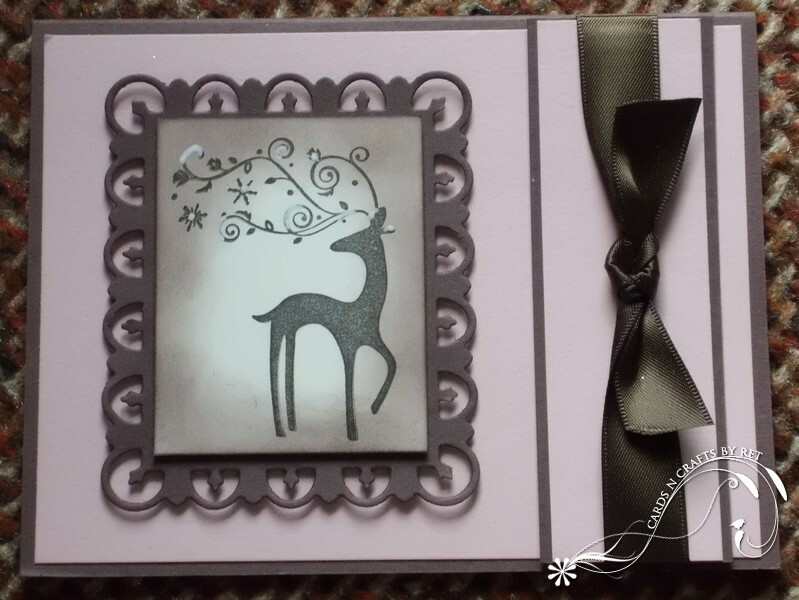 Here we have Stampin Up's "Dasher". He always stamps up so beautifully. I added a little white touches to the antlers with a white gel pen. 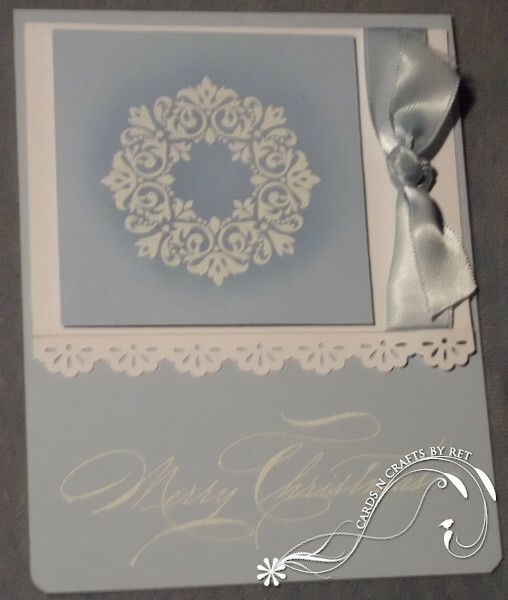 As you can see I used a Spellbinders Nestabilities, SU Blush Blossom and Chocolate Chip cardstock and ofcourse, SU Chocolate Chip satin ribbon. It's such a lovely ribbon to work with! I hope you enjoyed my card today, thanks for stopping in. Please leave me some love via comments, I love to hear from you, it makes blogging so much more fun!! 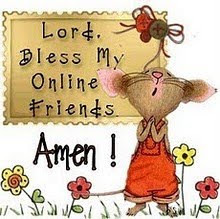 Have a super evening, and I'll be back tomorrow. I offer classes or stamp camps (whichever you wish to call them) in your house or mine. 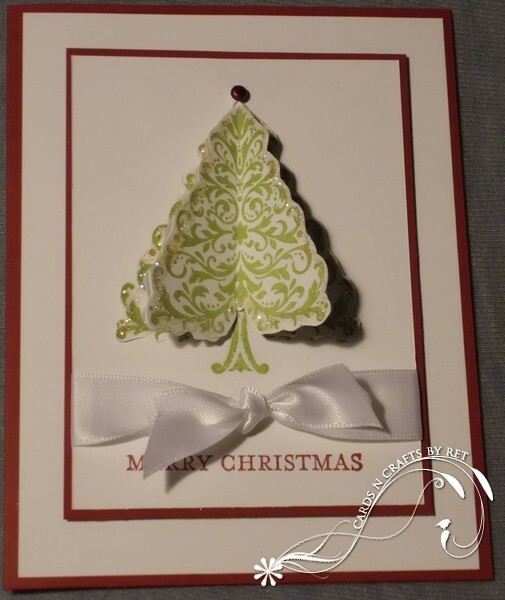 We'll make 3 cards for $15 or 5 cards for $20. To book or if you have questions, please call me at 757-2264 or email me at retcudmore@live.com. Hoping to hear from you soon! If you're interested...I also take orders for cards or custom cards. Thank you! Hi, I'm Ret Cudmore, welcome to my blog! I'm married to a kind and wonderful man. It's hard to believe we've been married for 10 years already! We have one cute lil fur baby, our Shih Tzu, Abbi. I am a medically retired call center sales manager. I'm originally from the Adirondack Mountains of Upstate New York, about 15 miles from Saranac Lake. My hubbys job has us living in beautiful Nova Scotia, Canada. I LOVE to stamp!!! It makes me happy! 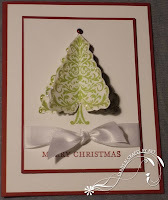 I first started rubber stamping to fill my time when I first moved to Nova Scotia. 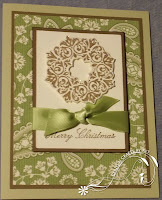 It wasn't long before I discovered that I loved making handmade cards!! I love that instant personal gratification I get from it. I also love teaching people to stamp, I love sharing the hobby!